Selected from an international pool of applicants, students in MICA’s Graphic Design MFA program include experienced designers who are seeking to reinvigorate their work as well as professionals and advanced students from related disciplines, including digital media, photography, journalism, and the fine arts. GD MFA students pursue advanced studio work in graphic design as well as courses in the history and theory of art, design, and culture. Students work in print, animation, web design, product development, environmental design, and other media. Writing courses help students use language as an expressive communication tool. 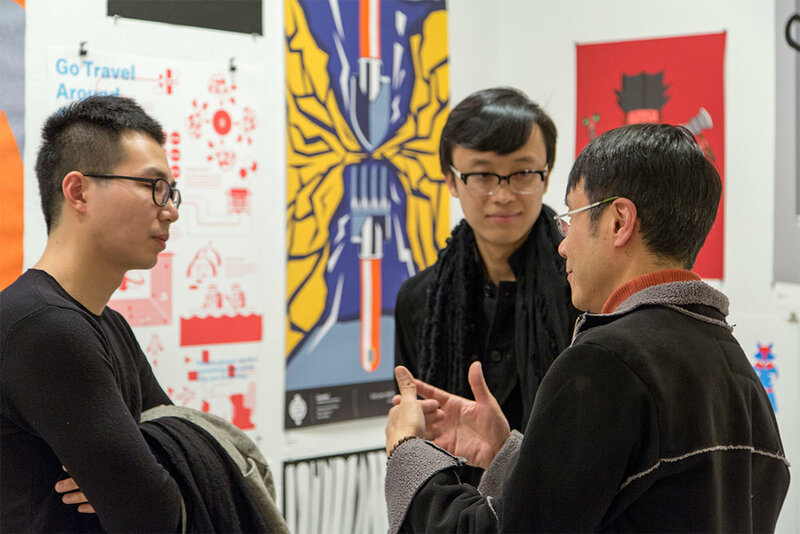 Students receive professional development experience by participating in exhibitions, international design competitions, guided research projects, and MICA’s Graduate Teaching Internship program. MICA’s GD MFA program takes a hands-on, practical approach to advanced design study. The program provides designers with an opportunity to rethink the direction of their careers by learning new skills and by working as the active authors/initiators of original creative projects. Our program is not a retreat from the real world. Instead, we provide a strategic location from which to develop intellectual and technical tools for engaging the larger society in which design functions. Participants in the Graphic Design MFA program seek to contribute substantial new thinking to the field of visual communication. Our students are engaging the cultural, social, technological, and aesthetic issues that are transforming today’s media and information industries. The 60-credit MFA program is designed to be completed during two years of full-time study, 15 credits per semester. Participants in the hands-on GD MFA Studio (3 credits) confront specific design problems, working both individually and in teams. The course is complemented by a rich Visiting Artists program (3 credits). Group discussions and critiques are balanced with individual meetings with faculty. Second-year students produce an independent thesis project organized around a structured series of benchmarks. Students begin defining a thesis project at the close of the first year. 6 credits for each of four semesters. MFA students select studio electives from MICA’s broad roster of offerings, from areas such as interaction design, photography, painting, printmaking, video, sculpture, environmental design, illustration, and fibers. Each semester, the GD MFA program offers several studio electives exclusively for GD MFA students, covering topics such as letterpress, typography, motion and interaction, and publication design. In any semester, students wishing to focus on independent projects can enroll for independent study credit in lieu of structured studio courses. Many students choose this option during the Thesis year. 6 credits for each of 4 semesters. MFA students are required to complete 12 credits of humanities during their 2 years of study. Courses in history, art history, theory, criticism, literature, and pedagogy are offered through MICA’s graduate and advanced undergraduate programs. Writing courses are an emphasis for GD MFA. 3 credits for each of 4 semesters.